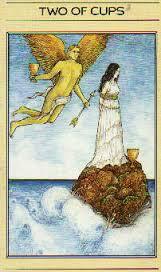 Duality, balance, and attraction are the implied indications in the Two of Cups. I find it curious to note, Eros is sneaking up on Psyche. He seemingly is attempting to take her by surprise but after Eros accidentally pricks himself with the arrow he intended to kill Psyche with, the unexpected result is, Eros falls in love with Psyche and their tumultuous relationship begins. As in life we're often surprised and fear the way events unfold. Something we initially might think as being a negative or a positive experience can often lead to a positive or negative outcome, because we've found another door that's opened to us when one has closed, one that we'd never imagined. It doesn't mean that this all will unfold in an easy manner, and it might be the case that the very opposite will be our reality. We may feel we've gone from the frying pan to the fire and have been completely kicked to the curb, but regardless, the end result will eventually be transformed into something better than what was before or maybe not. We do however have to find a way through. On the other hand the unfairness of life, as in nature, many times, makes absolutely no sense, leaving us fearful, confused, dumbfounded and despairing. We are left with the unanswered question, why is this happening? I've concluded if I have little to no ability or strength to accept life and death on the their terms,no mine, whatever is presented to me, this is when and what becomes problematic. Acceptance, not denial is always the key that opens a door of hope and freedom enabling me to overcome my fear. Once I got older lots of anxiety and then fear. The fear really pissed me off so I set about trying to overcome it. Seems like it's been my life long preoccupation. But now most times I face and embrace those fears (mostly avoiding emotional pain) instead of running away, which I often did. Facing and embracing my fears I learned my most important lessons in life and accomplished the most amazing things I never imagined I'd be able to do ever! Insight or New Age Woo-Woo and Unicorns?